This custom CD-player enclosure may not be your style, but you can’t deny that the fabrication techniques are top-notch (translated). This starts with a portable CD player and a set of amplified speakers. A brass plate serves as the base for the electronics, with the CD player internals mounted from the underside. The brass dome that covers the spinning disk also started as a sheet of metal, with quite a bit of work (translated) going into shaping and smoothing to achieve these results. The base and speaker boxes exhibit some fine woodworking, and there’s even additional electronics for lights, control buttons, and to drive the two analog meters. A lot of thought went into each component of this build and that’s how you put together a masterpiece. Awesome craftsmanship! I want one! Great build! Check out the photos. He seemed to be on a schedule (for a contest?) and took a few shortcuts, not that I see anything wrong. And he has over 100 comments without a steampunk putdown. Possibly we could learn from them? Also, I’ll have to get myself some of those record style CD-Rs. Put down your parent’s car keys and cancel that trip to the hardware store for gold paint and pipe fittings. nicely done, what drivers are those? If some school kid mounted a CD player in a homemade paper-mache box, you guys would be all over how it isn’t a hack and not worthy hackaday. This thing is beautifully made and I like it a lot, but is it a hack? Isn’t this just fine carpentry, and so not worthy of the site? C’mon nay-sayers – What exactly constitutes a hack? What are the rules? Does it run off steam ? Steam punk isn’t my bag, but I can appreciate craftsmanship when I see it. Speaking of bags, a shot bag can be used to shape metal into compound curves. How far out wold it be to modify actual pressure gauges to act as volume level meters? Though it would be less expensive & easier to modify junk box electrical meters to look like pressure gauges. Steam punk is a visual fashion thing mostly, so I wouldn’t criticize those who use off the shelf brass parts & paint to achieve the look THEY desire. They should be fulfilling their desires, not those of others. 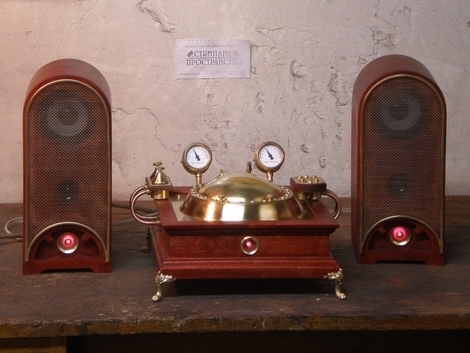 Mabye its just me, but wouldn’t a steampunk CD player be a record player? It is just the looks, no steam drive. It would be neat if it let out a puff of steam every now or then. Bonus points for the old clothes-iron power cord. Sadly I feel like that cheap cd player didnt deserve this mans fine craftsmanship. As for steampunk, its ok, I have all the love in the world for the Victorian age but for god sakes I would never put a brass fitting on anything unless it was actually used for its original utilitarian purpose. When I send this in i forgot to mention http://englishrussia.com/ where I saw this, there are often things mentioned who would better fit the “thereifixedit” category, but it is one of my favorite sites on the net. Does anyone else see a happy crab?